The Methodist Presbyterian Hostel is a mission guest house. Its role is to facilitate the work and travel of mission personnel and the broader church community engaged in partnerships or working with NGO’s in the Democratic Republic of Congo. 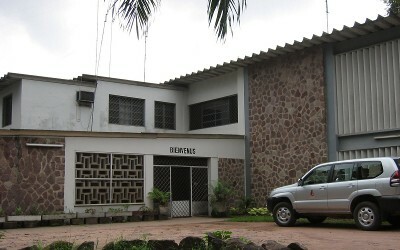 On this site, you will find lodging and travel information that may be of help as you prepare for your time in Congo. M.P.H. offers a variety of room accommodations and has the capacity to lodge up to 50 people. Our large conference room can hold around 40 people depending on the layout requested. The small conference room works well for up to 12 people. All our rooms have large windows looking out onto a spacious, quiet, backyard garden. We are located in the Ngaliema area of north west Kinshasa, #2867 Ave des Ecuries next to The American School of Kinshasa (TASOK). We hope you’ll join us at this quiet oasis. Our prayer is that MPH will be a place where you will make connections, meet kindred spirits, get some rest, and be blessed as you navigate Kinshasa or journey into the interior of the D.R.C. MPH is managed on a daily basis by a Congolese staff and two volunteers in mission, Clay and Cindy Dunn, with oversight given by PCUSA missionary, Inge Sthreshley. Clay has been working on much needed renovations to the building and Cindy has been improving management systems, training the MPH accountant on Quick Books, and attends to the myriad of details that need to come together for your pleasant stay! Clay and Cindy Dunn are volunteers. They need both your prayers and financial support to carry out the vital work they are doing at MPH. If you appreciate the improvements and their service to MPH and the community, please give to their support and pray for them! You can read about their work and prayer needs by subscribing to their newsletter Dunn’s Do’ins: www.clayandcindy.weebly.com.